Have you made the purchase of your official marginally famous Bangor Police Department Duck of Justice hoodie? Possibly a tee shirt? We assume you will need a bigger size than the Duck’s latest custom made hoodie. Ducks don’t need arm holes so the DOJ has his custom crafted at www.blauer.com. The folks in production room at the Blauer Uniform Company headquarters in Boston are fans of the DOJ and have sewn him his own green hoodie. It’s chilly in the museum and the Chief of Police has determined that we all need to economize this year- even the star of the show. Melody, Queen of the Front Desk, shot a video while the Duck’s glass was being cleaned. The folks at Blauer only work with the talent, the rest of us can order off the rack. All profits of Duck of Justice wear are donated to our community relations fund and used for cool and worthy causes. 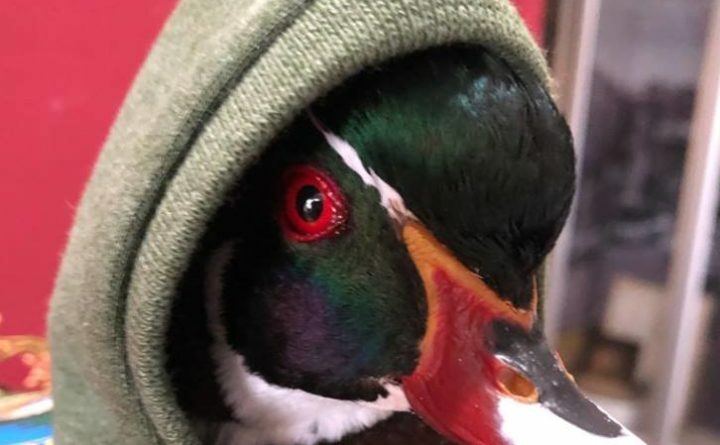 No ducks were harmed in the making of this video or this hoodie. There were reports to Boston PD that someone heard loud quacking in the basement at Blauer Uniform Company headquarters last week. For those of you who have questioned the lack of pockets- please be aware that Ducks do not have thumbs, and tend to leave cash and credit cards behind. For the punsters, who we all love to loathe, please don’t say “just put it on his bill.” No, just no. BPD Duck of Justice is published in BDN Maine Weekly on Thursdays. This installment is for Nov. 29.